"But has a quarter of that progress been made in Great Britain in the last two years ?" It may well have done, perhaps more thanks to The Times than the CEoGB, although many voices have been heard promoting the idea that riding bicycles shouldn't just be something that "cyclists" do. The recent Parliamentary Inquiry was titled "Get Britain Cycling" and heard lots of good evidence pointing in the direction of Dutch-style principles. 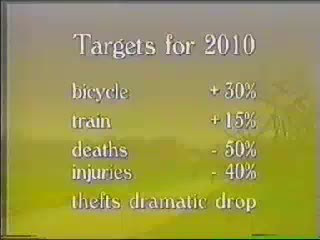 Even CTC are changing their stance on protected cycle tracks, slowly. LCC very nearly got London to commit to 2% of transport budget for cycling (I know, it's pitiful, but it's a lot more than is currently spent). We'll see what the "Get Britain Cycling" report looks like, and then whether the politicians back up their rhetoric with actual funding for serious infrastructure change. I have hopes that the tide is turning, certainly the debate has moved on significantly in the last few years. My children certainly won't be cycling to school on their own, aged 8, this year. 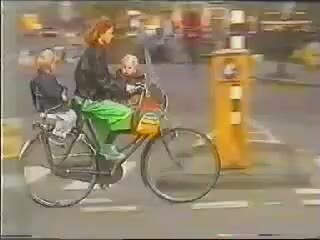 But they might be an awful lot safer cycling around ten years later when they reach 18. I wonder if we'll still be driving one-tonne motor vehicles still? The points are well made and we do need to make more progress more quickly for a whole raft of reasons. However,it is fair to point out that London is a much bigger city with a far larger population. Consequently the task is more challenging. But it is a challenge we have to meet. When I was growing up in the UK I had a good friend who lived in Amsterdam. I remember visiting in 1986. It was a great visit. I saw a lot of the country. The infrastructure was there for all to see. Distinct memories for me are catching the train to Utrecht and seeing separated bike paths alongside the railway line between villages. 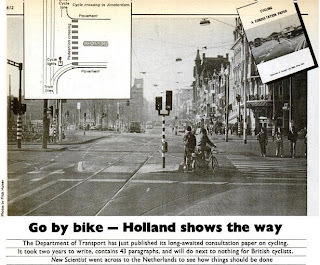 I also remember not just in Utrecht but whenever we went to a different town on the train, the infrastructure was noticeable as soon as you stepped out of the railway station and on to the bus. The 40 year claim is just another excuse. Amsterdam's Metropol Regio is around 2.3 million or so (and with a lot more bodies of water splitting it up). Yes, London is bigger, but not orders of magnitude bigger, and what happened to the rest of the UK? Not trying to be intentionally awkward or anything, but these arguments from population size/density aren't especially helpful and seem to involve a lot of cherry picking and shifting of goalposts. The thousand mile journey begins with the first step, and all that. David, I suggest at your organized study tours you should give not only bicycles, but also 2 brilliant books about road safety policies and design principles: „Design Manual for Bicycle Traffic“ and „Road Safety Manual“. Both publications are from CROW, and based on more technical books, such as „ASVV – Recommendations for traffic provisions in built-up areas“. Seeing is one thing, but to start drawing perfect roundabouts, entrances to access roads, road junctions architect needs exact schemas with exact measurements. N.B. I will try to bring *architects* to your tours this spring, because from previous tour we already have some movements to the right direction. All of them were made by one person (architect) from 4 of us, who took study tour in 2011. He would like to go to Netherlands once more, but to more technical tour. Because I already read those mentioned books, I feel confident on explaining and giving practical examples where theory is implemented in practise. Paul Canal, you confused me with your comment about a "much bigger city with a far larger population" until I realised that you must be comparing London with Amsterdam. Actually I'm not very interested in Amsterdam (I live 200 km away in a different city which is far better for cycling than is Amsterdam) or even just in cities. Just doing a city is relatively easy, but that's not what happened in the Netherlands. 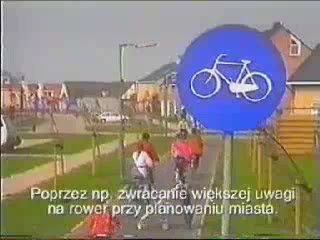 The cycling network covers the entire country. I can cycle from here to Amsterdam on decent infrastructure. British people also should not concentrate only on a few points on the map. It's the whole of the UK that needs to be transformed. Kedas: It would be great to be able to give people copies of such books, but they're expensive and it would increase the cost of the tour. The open Study Tours are run on a shoe-string budget. I only earn minimum wage if enough people come on the tour and sometimes I've run them at a loss. We don't spend much time looking at books during the tour because they can be read after returning home. What can't be done after returning home is seeing as much good infrastructure as possible and observing how it is used in practice. That is what we concentrate on. I'm very happy to hear that you have made progress since the tour in 2011. I'll contact you about the possibility of a further tour. "What do we want? Continual deterioration, masked by fantasies of past grandeur. When do we want it? 1961!" BG, I second your slogan. And may I add oy veh to it? 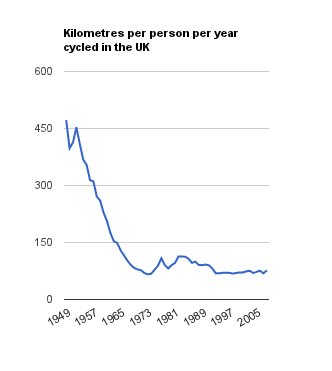 Not all British cycle campaigns take the "moderate reform, in due course" approach. We're campaigning for segregated infrastructure, now.